Small businesses rely on technology to communicate with internal and external customers. Online conferencing offers robust tools that boost collaboration across all channels. Check out these standout collaboration tools that benefit your small business. Although small businesses usually have a small staff, they may need to host virtual meetings for large groups. Virtual meetings are very convenient for vital conversations for board, investor and quarterly scheduled meetings. Small businesses need collaboration tools that give them the ability to accommodate a large group of participants. GlobalMeet makes it easy for small businesses to put their best foot forward with extended teams. This is crucial for online conferencing when multiple groups of people are involved. Collaboration should be easy for small businesses that rely on virtual meetings. The first step to making web meetings hassle-free is to use a conferencing software that makes it easy for meeting participants to join. For instance, GlobalMeet allows users to connect to virtual meetings via desktop or mobile device. It also simplifies joining by eliminating downloads for meeting participant and presenters. One of the most exciting features of GlobalMeet is its ability to connect remote participants. Virtual meeting participants can connect to computers for remote users. This feature takes collaboration during virtual meetings to the next level. Participants can view and access documents and other files directly from any participant’s desktop. Connecting remotely is extremely easy – which motivates teams to use these features to streamline collaboration and meeting productivity. This functionality is an effective tool to share information that is stored directly on a participant’s computer. In addition, multiple attendees can easily facilitate during any of your virtual meetings. 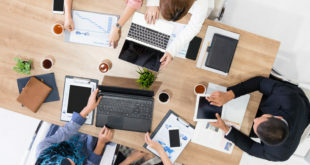 With so many ways for your small business to improve collaboration, hosting virtual meetings offer considerable benefits. Moreover, they empower teams to advance communication and productivity. Are you ready to take advantage of GlobalMeet?